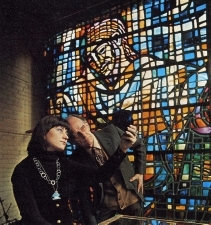 Rowan LeCompte, the American stained glass artist, had a window made at the Glass House for the clerestory of Washington Anglican Cathedral (see left ). 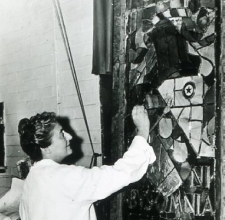 Caroline only had a post card sized sketch to work from but cartooned, cut and painted the window herself and afterwards considered her aprenticeship had been completed. 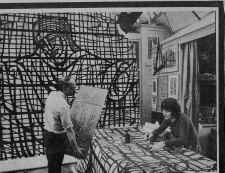 In 1972 the studio moved from the top floor of the Apothecaries Hall in the City of London to the Fulham Glass House, which had been the home of the important Arts & Crafts firm of Lowndes & Drury since 1905. 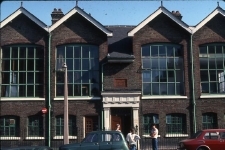 (see right: The Fulham Glass House in the early 1980's with only the original Lowndes & Drury top left hand studio still used for Stained Glass and the ground floor workshop on the right side of the front door). 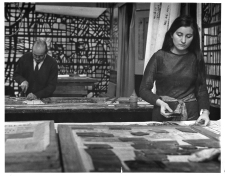 During those years Caroline also met the many Stained Glass artists who visited the Glass House including Keith New, Francis Stephens and Tony Holloway who rented Carl's first floor studio while making his windows for Manchester Cathedral. She continued the business under her father's name for several years after his death in 1985 before moving the studio to Hampton and working under her own name.